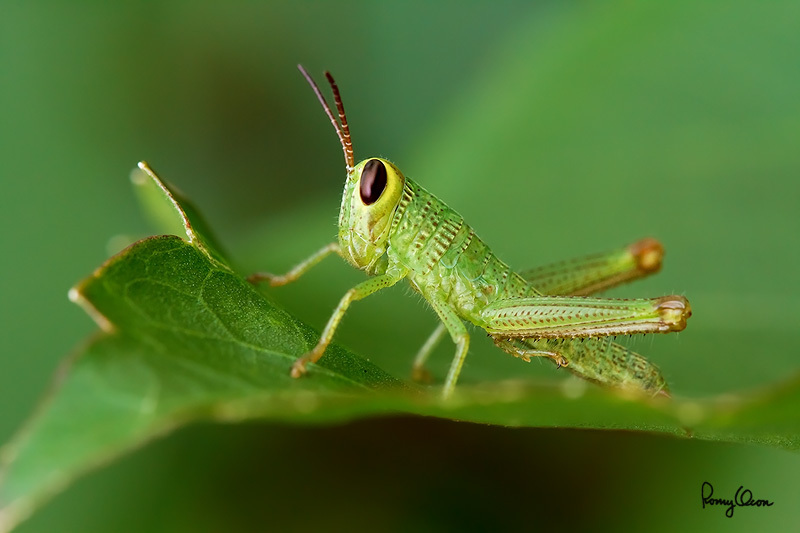 Although this young grasshopper stayed motionless atop a leaf, my hand holding was introducing some camera movement and that was messing with the precise placement of focus for one-shot AF. I switch to spot AI servo for this shooting condition to mitigate my hand holding movement. The Canon 7D’s ISO 800 RAW files clean up pretty well while retaining good detail when converted with the latest ACR. Shooting Info - Paranaque City, Philippines, July 24, 2010, Canon 7D + EF 100 2.8 USM macro, f/7.1, 1/200 sec, ISO 800, hand held, manual exposure in available light, spot AI servo, uncropped full frame.